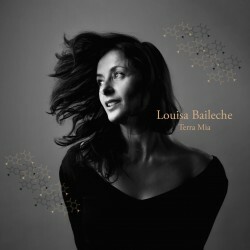 "Born to an Algerian father and an Italian mother, Louisa Bailèche was brought up in Paris. Her passion for singing dates back to her childhood and her first love was the traditional Italien songs that her mother sang. Her singing career was covered a wide and varied range of music. She was trained in clssical song at a Conservatory of music, sung French chanson and in rock bands. She even represented France in Eurovision in 2003. Here she returns to her Italien heritage, singing the popular and traditional songs from her youth. She makes a very good job of it. She is a commanding performer without pursuing the often uncomfortable 'diva' approach. She is prepared to use humour in the way she puts her songs accross and there are some very fine arrangements played by first rate musicians. Louisa comes accross as the sort of performer that would engage, win and charm an audience at Womad."